Dungeon of Signs: Wampus County - Play report. Wampus County - Play report. Played a game in Wampus County last night - Google + worked well until the GM was apparently carried away by storms and hail. My alter-ego was a 3D6 in order nebbish of a college twit named Chauncy. He is an unreilavble narrator, but since he came into some gems decided to write home about his first Wampus experience. Chauncy is a jerk, so when his overly bold 3HP self inevitably gets devoured by some terrible zombie beaver no one will feel sad. Letter is as follows and the Heathen practices of Preacher Jones are only causally referred to for the delicacy of civilized readers. My first my thoughts are with you and the children, per our plan I have arrived in Wampus County via the most torturous combination of leviathan, river barge and stage coach. It's a rough place, not even a simple book depository exists for me to continue my studies. I know it's a disappointment for you that that I was not able to obtain a position at a prestigious order, but the economy is troubled these days as you know. I believe that the Wampus will provide for me, of course the locals are crude, the amenities vulgar, and the fare not only meager but also revolting. A frog-man tried to sell me a fried frog on a stick upon arrival, I declined, but still regret not informing him of his autophagy. Inhumanity abounds, but so does wealth, the rough wealth of the frontier – I am currently in possession of ¼ a share of a bag of gems, taken by force from a clattering revenant. Yes I have begun to acquire wealth in the way of the Wampus folk – by ripping it wholesale form the land! The gems were discovered when I joined a rabble of “adventurers” who had access to an ancient ossuary. They claimed to have slaughtered a herd of zombie beavers, but turning animals into undead is such a pointless necromantic practice that I assume these low-lifes were simply playing a trick on the new man. My companions were a rough lot, but honest in the manner of simple men. A rustic preacher with questionable habits who carries a large club (presumably to silence those who disagree with his snake focused sermons) by the name of Mr. Jones, a barbarous soldier of some kind named Mr. Ironwall (who lives up to his name – I witnessed him shrug off a pair of lacerating sword blows that would have felled many a letterman), and a gambler, whose only real skill seems to be with the gun. We descended into an ancient clay pipe, with much concern about what lurked beneath, I am not afraid of superstitions and my arcane knowledge allowed me to see that the marking on the lid were mere charlatanry - but the locals are a superstitious lot. At the bottom the barbarian was forced to kick his way into a chamber filled with skulls. The descent was perilous I suppose, a dangling rope 35' down a pitch black pipe of ancient origin, I was able to handle the strain thanks to my days on the Tennis team, strong arms and shoulders being necessary to get the spikes properly lodged in the shuttlecock. 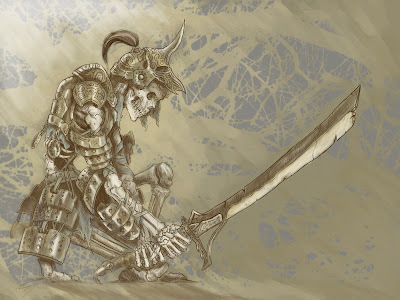 After a brief exploration, we discovered an animate cossack of some antique variety, his skeletal form mounted on a skeletal charger deep beneath the earth. The preacher attempted to frighten the cossack with his purported mystical power, accompanied by unsightly practices, but the horseman was nonplussed. The skeleton was disconcerted, and our spear wielding barbarian companion, unwilling to go without action, charged him, striking a mighty blow and shattering the skeleton's skull. I have not seen a finer athletic feat since last years' all college Tennis melee, but the horseman calmly reached for another skull from the ossuary walls. So shocked were my companions that we could not harm the undead thing, until it struck a wicked blow against our spear wielding companion. I was able to put a bullet into the skull of the skeleton's horse, but it was the spear of Mr. Ironwall, apparently enchanted for this sort of thing, and Preacher Jone's club that finally brought the horseman and horse to the ground. Mr. Early then stomped the last bit of thaumaturgy out of it. I tell you I added my own blows, just to make sure my companions knew I was game – the pitiful thing was done. After a search of the room I discovered many gems decorating a rather mundane pedestal and pried them up with my knife. A careful examination, using scientific method, I discovered that the skulls on the walls contained ancient prayers, undoubtedly to terrible demons and tentacled things, as well as a lovely opal. I intend to sell the stones, and promise to send you a portion so that the creditors may be put off, even briefly. Chauncey must make his family proud. Well Chauncey was considering writing the lads at the puissant baboon fraternal lodge, but the illegitimate children like to hear that their pops is doing well. Mr. Sandman, Send Me a Dream. SESSION IX, PART II - A Daring Rescue! The Obelisk - What now? SESSION VIII - Spacemen Zombies!